Severe pollution is rendering the rivers around the capital, Dhaka, biologically dead, with specialists warning the situation is beyond rescuing. “The rivers around Dhaka have too little oxygen for the survival of aquatic life,” Umme Kulsum Navera, assistant professor of Water Resource Engineering (WRE) of Bangladesh University of Engineering and Technology, told IRIN. “The water is especially toxic during the dry seasons,” he said. While oxygen levels increase during the monsoons, they are still too low for a healthy, thriving aquatic environment. According to research conducted by the WRE, some invertebrates and small organisms come to life in these rivers when water-flow increases at this time. But in the dry season, these life forms completely disappear in the four major rivers that encircle the city, including the Buriganga, Shitalakhya, Turag and Balu. According to the Bangladesh Inland Water Transport Authorities (BIWTA), an average 300,000 people use the Sadarghat terminal on the Buriganga, one of the largest river ports in the world, each day. Canoes act as taxis to ferry people across the polluted River Buriganga, Dhaka city, Bangladesh, July 2007. Transport has not been planned or developed to meet the needs of the growing city population. This has impacted negatively on Dhaka’s growth. In past decades, the changing nature of the river has forced many – particularly fishermen - to switch livelihoods as the Buriganga no longer holds any fish. “From November through May, what flows through the river is anything but water, only a thick, stinky, black liquid. I haven’t seen a fish or aquatic growth in the river in the past 20 years or so. In our childhood we saw hundreds of fishermen catching fish and dolphins playing around in the Buriganga,” Sheikh Abdur Rahim, 55, a local fruit trader and long-time resident of the Sadarghat area said, a fact echoed by other residents. Even the slightest physical contact with the water, which could be described as nothing more than raw sewage, is potentially hazardous, say health experts. “Most of the boatmen around the Buriganga have several types of skin disease. The poisonous water is responsible as there are major toxic elements in the water, from irritants to carcinogens,” Abdal Miah, a dermatologist in Dhaka, told IRIN. Meanwhile, the Shitalakhya, another major river that flows along the eastern part of the city, has become so polluted that its foul stench can be smelled half a kilometre away. 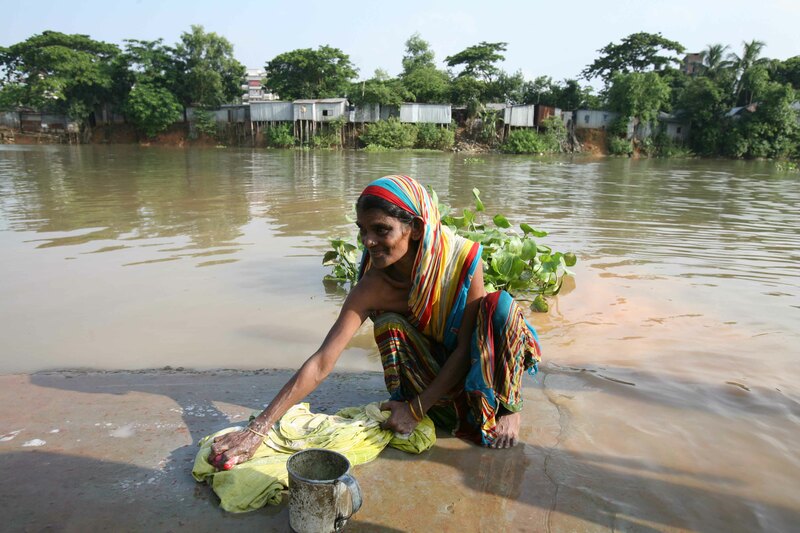 A woman washes her clothes in the River Buriganga, Dhaka Bangladesh, July 2007. The poor live in miserable conditions, the affluent as well as the poor breathe polluted air, and traffic congestion and poor infrastructure services are choking the city. Despite a 1995 Environment Conservation Act, stipulating that all industrial units must have proper treatment plants to get clearance from the Department of Environment (DoE) and hence supplies of gas and electricity, the reality is quite different. According to the Institute for Environment and Development Studies (IEDS), a leading local environmental NGO, thousands of small and medium factories dump industrial effluent directly into the rivers. "The concentration of organic pollutant in the Buriganga is 17 times higher than the allowable limit of 3mg per litre. 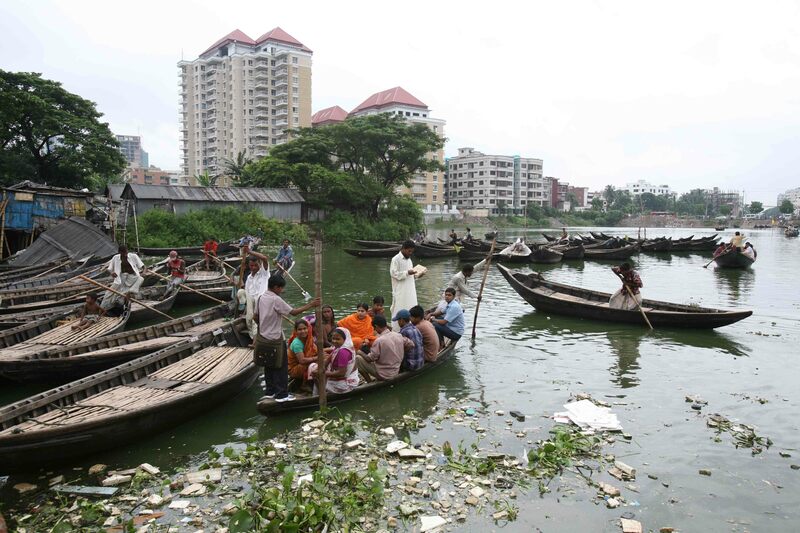 Chemical pollutants like ammonia, aluminium, cadmium, lead and mercury have also been detected in the Buriganga," SM Mahbubur Rahman, head of the water resource planning division of the Institute of Water Modelling (IWM), said. The lone sewage treatment facility operated and maintained by Dhaka Water Supply and Sanitation Authority (DWASA) has a treatment capacity of 0.12 million cubic metres per day, while the daily volume of sewage generated in Dhaka city is 1.3 million cubic metres. The untreated portion is dumped into the rivers around Dhaka. At a conference on drinking water in Dhaka held in May 2009, the Industries Minister Dilip Barua admitted that the industrial sector lacked social responsibility plans, especially when it came to effluent treatment plants. The installation of such plants would be enforced stringently by the government and efforts would be taken to relocate the tanneries from the capital city, he said. There are around 700 rivers in Bangladesh with a combined length of more than 24,000km.